Bibles, and threatened one believer with a 15-day jail term and deportation, even though he is a Turkmen citizen. 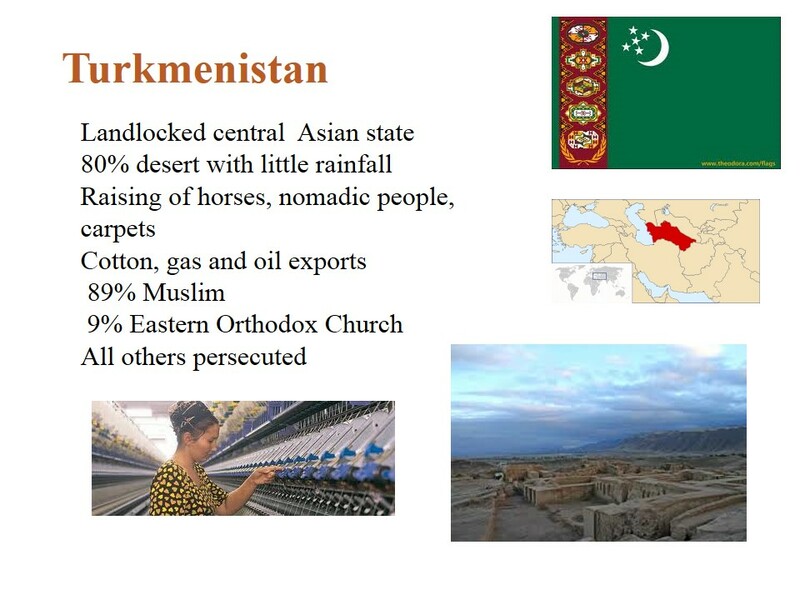 Homes raided, business closed and ousted from town; threatened with expulsion and harassment of their children at school; taken to court and fined: this was summer 2012 for Christians in Turkmenistan. Protestant Christians faced an upsurge in harassment, raids, threats and legal action then. The situation has got markedly worse since July 2012 and we don’t know why. Children of believers can be singled out by head teachers and individual teachers for ridicule and can have their grades lowered because of the faith of their parents. 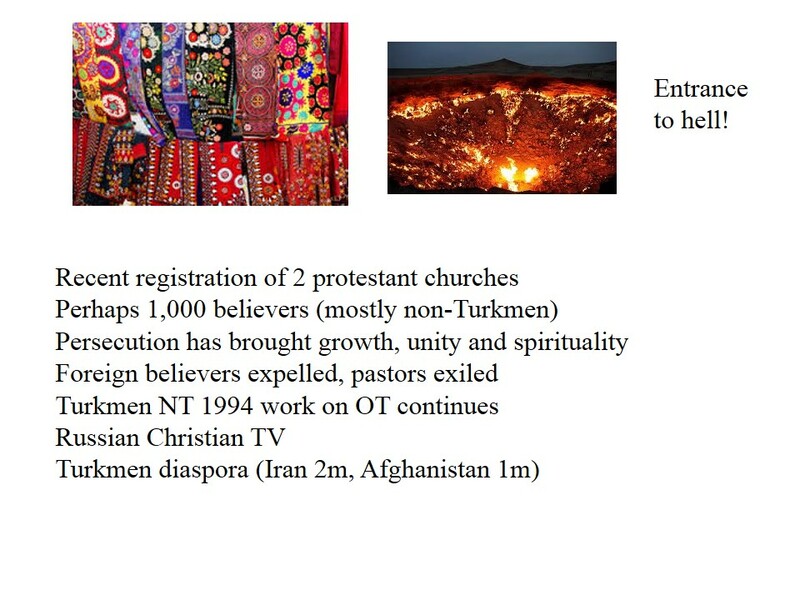 While Turkmenistan’s constitution theoretically grants religious freedom, a Religion Law passed in 2003 forbids any activity by unregistered religious groups. The authorities try to suppress Christian activity, subjecting believers to raids, fines or exile; some lose their jobs and homes, and pastors are sometimes beaten or imprisoned. Pray that Christians in Turkmenistan will stand firm in their faith and that they will find favor with Turkmen officials. Pray that the church will not lose its registration and that members will be able to meet freely and without government interference. Pray for the salvation of Turkmen lawmakers and enforcers. VOM provides Christian literature and other means of assistance for believers in Turkmenistan. Umid Gajaev was jailed for 4 years in 2012, on trumped up charges. Pray for his release & for his wife Malahat & 3 children. 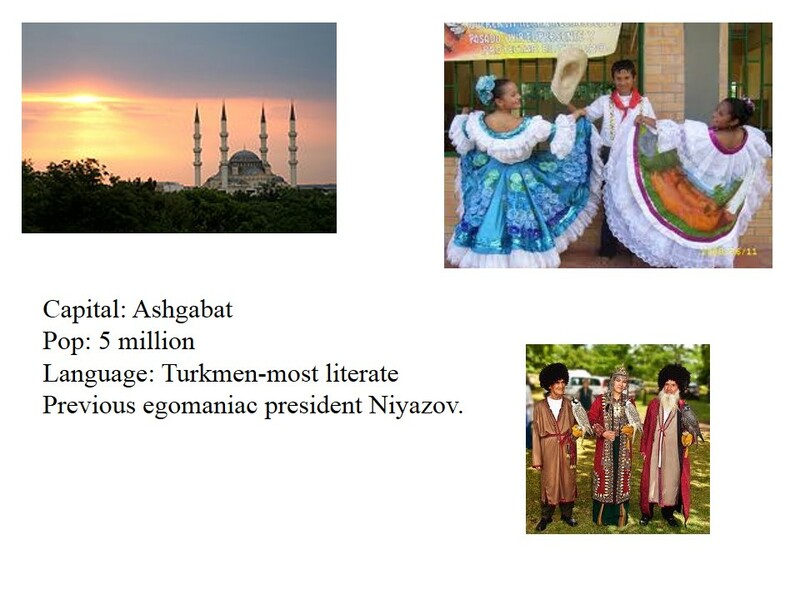 This entry was posted in Turkmenistan. Bookmark the permalink.